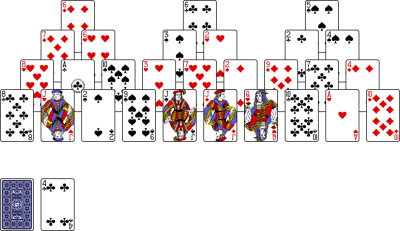 World of Solitaire is primarily the work of one person, me. decided I had procrastinated long enough and started working on it. dragging, dialogs and other various things. radio buttons and the animation speed slider. The Aptana IDE is my editor of choice for developing web sites. 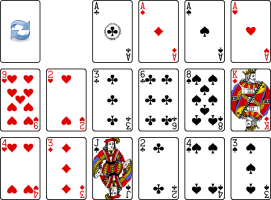 Click to re-deal the cards in sets of 4. They are not reshuffled. 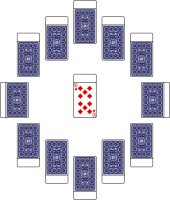 Click to re-deal the cards in sets of 4 using the traditional redealing method. They are not reshuffled. 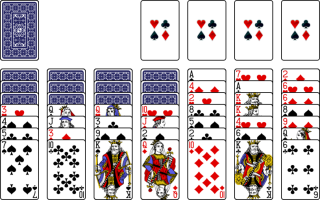 Game: All Aces Up Baker's Dozen Baker's Game Baker's Game (Kings Only) Canfield Castles in Spain Clock Cruel Cruel (Traditional Redeal) Double Klondike (Turn One) Double Klondike (Turn Three) Eight Off Flower Garden FreeCell Forty Thieves Golf Golf Relaxed Klondike (Turn One) Klondike (Turn Three) La Belle Lucie Montana Pyramid Pyramid Easy Pyramid Relaxed Pyramid Relaxed Easy Russian Solitaire Seahaven Towers Scorpion Spanish Patience Spider Spider (1 Suit) Spider (2 Suits) Sultan Three Shuffles and a Draw Trefoil Trefoil and a Draw Tri Peaks Tri Peaks Strict Triple Klondike (Turn One) Triple Klondike (Turn Three) Yukon Global and Leaderboard statistics are updated every 5 minutes. - Now if you move an Auto Played card, it won't try and auto play it again until you've made another move yourself. 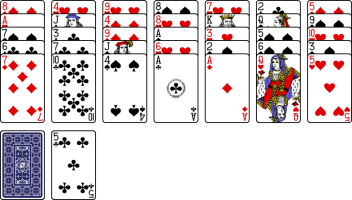 - The Deck menu has been changed! -- It now only shows the top 4 most used decks. 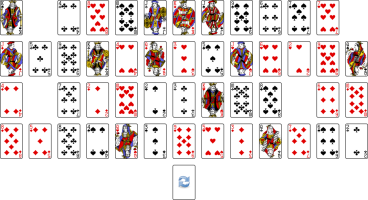 -- There is a link to 'See More Decks...' that pops up a 'Deck' window. 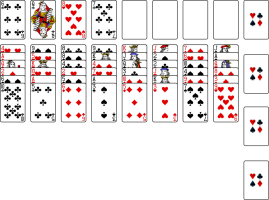 -- This window allows you to browse all decks, and see a preview of ALL the cards contained in that deck. - NEW GAME! Eight Off has been implemented! - NEW GAME! Baker's Game has been implemented! - NEW GAME! Baker's Game (Kings Only) has been implemented! - NEW GAME! 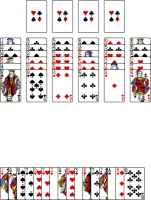 Russian Solitaire has been implemented! - NEW GAME! 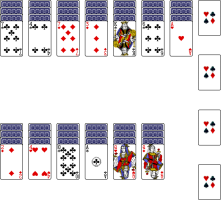 Double Klondike (Turn One) has been implemented! - NEW GAME! Double Klondike (Turn Three) has been implemented! - NEW GAME! Triple Klondike (Turn One) has been implemented! - NEW GAME! Triple Klondike (Turn Three) has been implemented! - NEW GAME! Cruel (Traditional Redeal) has been implemented! - NEW GAME! Cruel has been implemented! - The Timeline graph in the Statistics is now working again! Nice and fast this time. - The leaderboards have been fixed! - Global statistics now update every 10 minutes! - NEW GAME! La Belle Lucie has been implemented! - NEW GAME! Three Shuffles and a Draw has been implemented! - NEW GAME! Trefoil has been implemented! - NEW GAME! Trefoil and a Draw has been implemented! - NEW GAME! Tri Peaks has been implemented! - NEW GAME! Tri Peaks Strict has been implemented! - NEW DECK!!! The 'Oxygen - White' deck has been added! Enjoy! - Fixed a bug that caused Pyramid and several other games to be broken! SORRY! - NEW GAME! Flower Garden has been implemented! 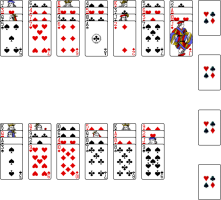 - Added a 'Percentage' next to the 'Hands Won' and 'Hands Dealt' statistics in the Statistics window. 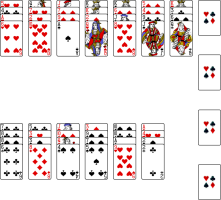 - Fixed some bugs that caused some games (like Sultan) to not correctly begin when dealing a new hand. - NEW GAME! Sultan has been implemented! - NEW GAME! Clock has been implemented! - NEW DECK!!! The 'Animals' deck has been added! Enjoy! - NEW GAME! Golf Relaxed has been implemented! - [Baker's Dozen] If multiple kings appear in a stack they are now correctly placed on the bottom of the stack. - [Canfield] Fixed a bug that prevented you from being able to redeal! Sorry! - NEW DECK!!! The 'Majestic' deck has been added! Enjoy! - Your Options are now saved to your username automatically and loaded whenever and wherever you login. - [Spider] [Scorpion] Fixed a bug preventing you from winning these games (incorrect number of foundations). Sorry about that. - NEW GAME! Scorpion has been implemented! - NEW GAME! Aces Up has been implemented! - NEW GAME! Montana has been implemented! - Fixed a bug in the random number generator. 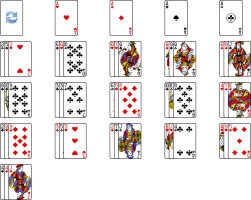 Cards should be better randomized now. - A Leaderboard is now available in the Statistics window! - You can now change the background! Choose from two new patterns or enter your own web address to an image. - NEW GAME! Spider (2 Suits) has been implemented! - NEW GAME! Spider (1 Suit) has been implemented! - The Statistics can now be viewed per game! - NEW GAME! Baker's Dozen has been implemented! - NEW GAME! Spanish Patience has been implemented! - NEW GAME! Castles in Spain has been implemented! - Removed the 'Chance of Winning' game info. It was not accurate. 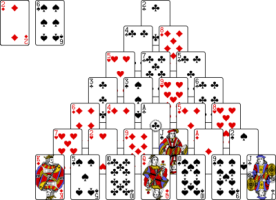 - [Pyramid] Fixed a bug that caused the cards to behave oddly after undoing a move. 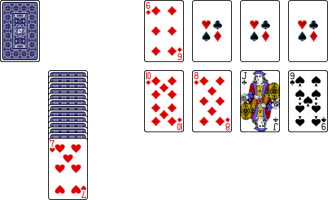 - [FreeCell] [Seahaven Towers] You can now move one complete stack to another empty tableau. 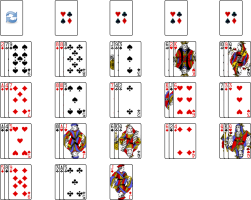 - [Yukon] Fixed a bug that caused stacks to be limited to 14 to 20 cards. - Fixed a bug in the Timeline graph. Correct values now appear. - NEW GAME! Golf has been implemented! - NEW GAME! Seahaven Towers has been implemented! - You can now register an account in order to keep your statistics forever and play on multiple computers. Any stats you've already accumulated are safe and when you register they will stay with the Username you create. - NEW DECK! Anglo-American deck is now available! - NEW GAME! Canfield has been implemented! - Safari and Konqueror should now work okay again! - The 'Select Game' dialog has been improved. - Forty Thieves has been implemented! - The web page should load up faster now. - Yukon has been implemented! - Spider has been implemented! - Added a new game! Pyramid! - The animation when you win is much cooler now. Big thanks to Peter Vel for coming up with it! 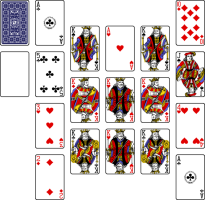 - You can now choose additional Solitaire games! 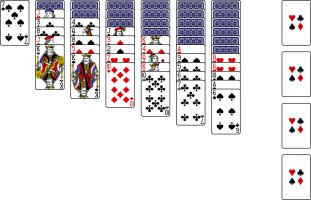 Choose 'Select Game' from the Solitaire menu. - You are now rewarded for winning! Enjoy! - An 'Auto Flip Cards' option is now available and enabled by default.